The picture is of Frederick Temple who was Bishop of Exeter from 1869 until 1885 before becoming Bishop of London and then Archbishop of Canterbury in 1897 going on to conduct Queen Victoria’s funeral. I quoted him and his son William (who was born in Exeter, and also became Archbishop or Canterbury) in a sermon I preached at a joint Anglican-Methodist Remembrance Day service at St Mary’s Church, Morchard Bishop, Devon, this morning. This roughly what I said: The 11th hour of the 11th day of the 11th month marked the signing of the Armistice on 11 November 1918. It signalled the end of the First World War. The guns on the Western Front fell silent after more than four years of dreadful war. Tiny parish of Down St Mary 9 men lost lives – imagine this over whole country. My father was 8 my mother was 12. Nearly 20 years later, having met in Cornwall, they got married in 1937 and, two years later the Second World War began. I was born on 4 April 1945 and 33 days later, on 7 May, Germany surrendered [I take no credit!]. On the 20 June, when I was 77 days old, one of Hitler’s bodyguards, who escaped to the, by then, British side of Berlin, said that he had seen the partly burned bodies of Eva Braun and Hitler lying side by side in the grounds of the Reich Chancery near the entrance of his bunker. It had been a joint suicide. Being very tiny I remember nothing of those events. I do remember playing in the air raid shelter at the bottom of our garden in Exeter and going to the shops with my mother when you still had to produce ration books. Next year will mark the centenary of the outbreak of the 1WW and we shall mourn the wasted potential of so many who died so young. And we feel the same about the 2WW. You have to be over 85 to have served in that war. Moving to hear some of the survivors speaking this weekend. Now I think it’s good that Remembrance Day is set aside for us not only to remember those who gave their lives in both World Wars but also the many others who have given their lives in conflicts since 1945 and some, such as Afghanistan, which are continuing today. It’s good that we remember too those who have survived but carry with them terrible injuries. Our New Testament reading (John 15:9-17) was also read at last night’s Festival of Remembrance at the Royal Albert Hall. It began (v9): As the Father has loved me, so have I loved you. Jesus is speaking about a perfect love that has been given to us. How do we know that Jesus loves us? Indeed how do we know what love is? The answer is given in some more words from John, in his first letter, which is totally relevant to remembrance Sunday (1 John 3:16): This is how we know what love is: Jesus Christ laid down his life for us. And we ought to lay down our lives for our brothers. I believe that the world would never have known the meaning of love if it had not been for the cross of Jesus. But the Apostle John would not have shifted from his position. And nor need we. All human love falls short of loves ideal. Much human love is fine, and courageous, and noble – but all of it is tainted to some degree by ulterior motives and is therefore a mixture of selfishness and unselfishness. Only one act of pure, undiluted love has ever been performed in the long history of humanity, and that is the self-giving of Jesus on the cross of Calvary. There he loved with perfect love. He gave everything – himself – for you and me. Love is sacrificial service – giving yourself to serve others. And John says we ought to lay down our lives for our brothers and sisters. The call to lay down our lives is not necessarily a call to spectacular deeds of heroism – though to today we are remembering many who did perform deeds of heroism. It includes unspectacular (though no less heroic) deeds of service. We can ‘lay down our lives’ when we give our lives freely in the service of others. In the early morning of 4 May, during a heavy air raid on Exeter, a large high-explosive bomb hit the cathedral, exploding in the chapel of St James in the aisle on the south side of the choir. The chapel itself, a room above it, three bays of the aisle, and two flying buttresses were completely destroyed; one part of the Bishop’s Palace was badly damaged, together with glass, screens, monuments, their canopies and other furniture. However, the main structure of the cathedral was mercifully intact. I’m not sure if my father discovered whether that couple’s house had been damaged. However If you go into Exeter cathedral a number of things will remind you of those bombing raids in Exeter – the monuments in memory of Devon worthies at the south east corner of the cathedral have faint but visible lines of a jigsaw. This is because, in the years after the war, a team of craftsmen and volunteers set themselves the huge task of finding, identifying and reassembling the thousands of fragments of wood and stone which lay about the cathedral. They lovingly sorted through all the fragments, identified where they came from, and painstakingly reassembled them so that over the years the cathedral took on the appearance it has today – including the restored monuments with their faint jig-saw lines. Beauty replaced brokenness. But if, next time you go to the cathedral, you stop when you enter the main door at the west front, and turn around you will see a plaque commemorating Bishop Frederick Temple. 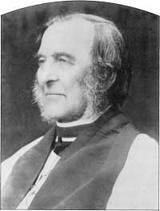 Frederick Temple was Bishop of Exeter from 1869 until 1885 before becoming Bishop of London and then Archbishop of Canterbury in 1897 going on to conduct Queen Victoria’s funeral. While he was Bishop of Exeter, in 1881, his son William was born – actually in the Bishop’s Palace. Now William also went on to become Archbishop of Canterbury in the last war. This makes them the only father and son in the history of the Church of England both to become Archbishop of Canterbury. Not a lot of people know that! Now Frederick, the father, will certainly have visited this church while he was Bishop of Exeter and conducted confirmations. He was, apparently, a very blunt man who spoke his own mind and was a little awkward socially – not being very good at small talk. But he had a good relationship with his son William. And William wrote that his father, though so blunt and outspoken, and who was described by one person who knew him as ‘granite on fire, could not preach about the love of God without tears rolling down his face. Maybe the people of Morchard Bishop witnessed this occasionally from (this pulpit) in the 1870s and 1880s. Now Frederick’s son William wrote a wonderful book ‘Readings in St John’s Gospel’… He wrote about our New Testament reading for today [John 15:9-17]. William Temple said that the promise of Jesus is not only that we may be joyful but that we may know a joy of the same quality and substance as the joy that Jesus knew. He quoted the writer of the Letter to the Hebrews who wrote (Hebrews 12:2) that we should fix our eyes on Jesus, the author and perfecter of our faith, who for the joy that was set before him endured the cross, scorning its shame, and sat down on the right hand of the throne of God. William Temple said that this joy is not the same as external happiness, but is a state of our souls, our inner beings. It’s a condition of the soul that is filled with love – just as joy comes next to love in the list Paul described as the fruit of the Spirit in his letter to the Galatians. We are all made in the image of God – and that image is love. God’s image in us is distorted and defaced – we are self-centred and not perfect in love. Yet we can ‘reflect as in a mirror the glory of the Lord’ [2 Cor 3:18]. And Jesus, who is the ‘express image’ of God’s substance [Heb 1:3] is that image which we were created to bear. This call, against which our self-centredness rebels, is actually a call to be our real selves. The call to the pain of self-sacrifice is also, and more deeply, the call to have our joy made complete. We had read to us the classic Remembrance Sunday text: Greater love has no-one than this, that he lay down his life for his friends. Some people have asked, is it not greater love to die for enemies than friends? But the word friends doesn’t here so much represent those who love Him (or the lover) but those whom he loves. The text declares that love has no more complete expression than death on behalf of those to whom it is directed. Love unto death is a complete self-giving. That is what Jesus endured for his disciples; and that self-giving love is what we, as followers of Jesus, are called to practise. There’s more: I chose you and appointed you to go and bear fruit [v16]. We were chosen first and foremost for fellowship with Christ – that is our first duty – to abide or remain in Christ. He is the vine, we are the branches. But he also chose us to be his witnesses. The thought in this verse is that of going about our business whatever it may be. It is in doing that we are to bear fruit, fruit that will last. A real Christian, who abides in Christ and Christ in him, exerts an influence among his companions at work or play, in shop or factory or farm or office or school as well as in the family and at home. When you and I are like that we become a channel through whom the love of God may flow in blessing to others. And then we get a wonderful promise about prayer: Then my Father will give you whatever you ask in my name. Note that this is true so far, and only so far, as we pray in the name of Christ – and that we can only do if we remain in him and his sayings live in us. When we behave like that and trust like that and pray like that we become a new community of love in a world which so badly needs it. In such a community, of course, there would be no more war. But in a fallen world, sadly, war remains. It isn’t in your power or mine to prevent war. But as members of this community of love, wherever Jesus takes you and takes me in the coming days, let us remember, especially in places of tension and conflict, the words of the Lord Jesus ‘Blessed are the peacemakers, for they will be called sons and daughters of God’. How different the world would be next year, when we mark the centenary of the outbreak of the first world war, if it were a world of people characterised by obedience to the teaching of Christ, prayerfulness, peace-making and self-giving love. Thinking of those broken monuments in the cathedral put together again and made beautiful reminded me of Graham Kendrick’s song ‘Beauty for brokenness, hope for despair, Lord, in Your suffering world this is our prayer. Shelter for fragile lives, cures for their ills, work for the craftsmen, trade for their skills. Refuge from cruel wars, havens from fear, God of the poor, friend of the weak, give us compassion we pray: melt our cold hearts, let tears fall like rain; come change our love from a spark to a flame. This church, where Frederick Temple preached, would be a good place for us all to rededicate ourselves to building that new community of love. Amen.